A truly diversified portfolio of comedic stock! Last year Melissa McCarthy was a spy; and this year, she’s the boss. Over and over again, McCarthy proves that she is a brilliantly talented funny lady. And whereas some may see this movie as a sloppy pandering comedy, I see it as a fantastically entertaining movie with a pretty good plot filled with well-developed characters. No story exists without conflict, and comedy is no different. The best comedies are those full of conflict that ignites the hilarity and irony. Very much in the vein of other McCarthy comedies, The Boss is over the top. But, that’s perfectly acceptable because the movie certainly opens with a larger than life scene, and the movie never pretends to be something that it’s not. This type of comedy knows exactly what it is, and it rocks it! I always have more respect for movies that do not pretend to be anything other than what they are. It’s designed to provide an escape from the doldrums and mildly depressive lives many of us have and provide us with the best medicine–laughter. Is this new comedy on par with Bridesmaids or Spy? No. But, is it funny, filled with fun characters, conflict, and satire/parody? YES. 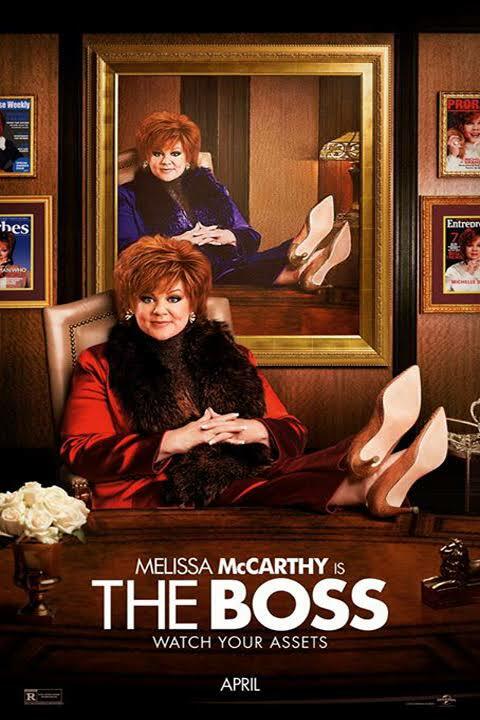 Universal Pictures’ The Boss is a slapstick comedy about media and economy mogul Michelle Darnell (McCarthy) who has pulled herself up from the tragic and challenging roots of her childhood to become the CEO of multiple Fortune 500 companies. But, like with all good things…after inside information, Michelle is found guilty of insider trading after a tipoff from a former friend turned enemy of hers. Having all her assets frozen, personal property confiscated, and losing her house, Michelle has no where to go after her short four-month stint in a white collar correctional facility. She has to turn to her former executive assistant Claire (Kristen Bell) for help. After driving Claire and her daughter crazy, Michelle is forced to start pulling her weight, which means taking Rachel, Claire’s daughter, to her Dandelions meeting (totally a parody of the Girl Scouts). That proverbial meeting proves to be just the catalyst Michelle needs to return to the top. However, she will soon come face to face with all new challenges in her business and personal life as she rises back to her previous epic heights. At first glance, this movie appears to be another zany comedy that only McCarthy can pull off. Much in the same way Amy Poehler and Tina Fey are often type casted. But, a closer look at The Boss reveals a surprisingly well-developed and executed plot that is incredibly well-paced and includes impeccable comedic timing. Like with Poehler and Fey’s Sisters, this movie too has a heart-warming message throughout the narrative. You’ll just have to watch it to find out what that is. Like with the opening scene at Chicago’s United Center with Darnell descending to the stage on a fiery phoenix alive with pyrotechnics, Michelle herself is larger than life. Interestingly, this opening parallels the career or acting-style of McCarthy. She is the type of actor that has yet to prove a wide range of characters; but with the characters she plays, she is often the most dominant character whether among the supporting or leading cast. We expect her to provide us with that which we are accustomed to watching and enjoying. And in that respect, she has yet to fail her audience. The phoenix at the beginning also symbolizes, as many of us know, the rising from ashes of defeat to become even more resilient and powerful than before. The character of Michele Darnell is very much a phoenix in this story. But is she the only phoenix? No. Michelle’s former assistant Claire is also a type of phoenix. Granted, she was not on top of the world and fell from splendor, but she also takes a journey similar to the phoenix. As Michelle’s assistant, she had a good job (although not paid nearly as well as she should have been)–let’s just go with the fact that she was employed. When Michelle lost her assets, she was no longer able to pay Claire and she was forced to take employment elsewhere. From riding around with Michelle in Cadillac Escalades to working in a cubical in a administrative pool, Claire fell from the glamour she was associated with by extension. After several turning points in the movie, which you will just have to see for yourself, Claire begins to rise up to achieve goals she never thought she would–personal and professional triumphs. Unlike many comedies, this one has a dynamic range of dialog, physical antics, and high brow humor that is sure to keep you laughing during the movie. Furthermore, contrary to how many may perceive or expect of comedies, it is important that the audience not continuously laugh the entire time. If there is so much “funny” in the story structure, then the moments that should elicit the most laughter won’t succeed because they will just fall in line with the rest. It’s like Michelangelo’s famous Sistine Chapel ceiling fresco. Although I have never been, from others who have told me about their travels, the ceiling is not nearly as impressive as one may think it to be. Why is that? Because there are many painted ceilings throughout the chapel so Michelangelo’s masterpiece is fairly anti-climactic. Fortunately, The Boss strikes a pleasant balance and timing between the high comedic elements in plot and dialog. Another component of this movie that is sure to please the audience is the cameo by Kathy Bates! Thats right. Better known for her more serious roles, Kathy Bates is one of the most amazing actors because she can truly play a wide range of characters in film or television from the serious to the funny. It takes only the highest level of acting to be able to deliver brilliance in such a short amount of screen time. Plus, having Bates just classes up the film a little! If you love Japanese katana fights, this movie has it! If you are a fan of McCarthy’s style of comedy? You won’t be disappointed. Having a bad week and just need to laugh for a while, then this movie is for you! There is little that I did not enjoy about this comedy. By no means to I argue that this is an amazing film–certainly that isn’t the case. But, is it s FUN movie that is actually well-produced, written, and acted? Yes it is. Melissa McCarthy always makes me laugh.